Currently the number one non-surgical aesthetic treatment in the U.S., Botox® is also the leading brand of botulinum toxin type - A in terms of documented clinical trials and practical use around the world. It was the first botulinum toxin to gain a cosmetic licence endorsing its use for glabellar lines and wrinkles (as well as also being the first to get a licence for a crow`s feet indication). It is approved for glabellar treatments in the U.S. and around twelve other countries in the world, and was licenced for this use in the U.K. in March 2006 under the brand name Vistabel®. Botox® is made from purified type - A neurotoxin produced by the bacteria Clostridium botulinum. It temporarily prevents the release of acetycholine from sympathetic nerve terminals. To learn in detail how botulinum toxin injections work, please click on Botulinum Toxin Treatment FAQ. It should be used by trained members of the medical profession only. A face-to-face consultation with a prescribing practitioner (i.e., doctor, nurse independent prescriber, dentist or pharmacist prescriber) is required before treatment can be performed by the same person or delegated to another practitioner. Please go to our Find a Clinic section to find a practitioner specialising in this treatment. Botox® is licenced in the UK for blepharospasm, hemifacial spasm, cervical dystonia, severe hyperhidrosis of the axillae, dynamic equinus foot deformity due to spasticity in ambulant paediatric cerebral palsy patients, two years of age or older, and for wrist and hand disability due to upper limb spasticity associated with stroke in adults. In January 2014, Botox® was granted a licence for "the temporary improvement in the appearance of moderate to severe lateral canthal lines (crow`s feet lines) seen at maximum smile, either alone or when treated at the same time as glabellar (or frown) lines seen at maximum frown, in adult patients where these facial lines have an important psychological impact". Who should not have treatment? 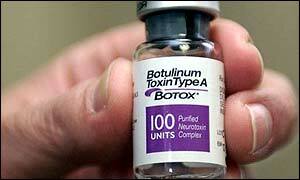 Click on Botulinum Toxin Side Effects to learn more about the risks or side effects. Most clinics and practitioners charge by area of the face treated. These areas are usually defined as crow’s feet, forehead lines, and glabellar lines (frown lines between the eyes). Because it is a prescription only medicine; it had to undergo strict clinical trials in the U.S., where it is approved for cosmetic use, in order to gain a license. Remember, the drug has been licensed in the U.S. since the late 1980s. The graph below shows the results of a study published in 2001. 500 patients were injected three times in a year with Botox®. They were injected on days 0, 120 and 240. 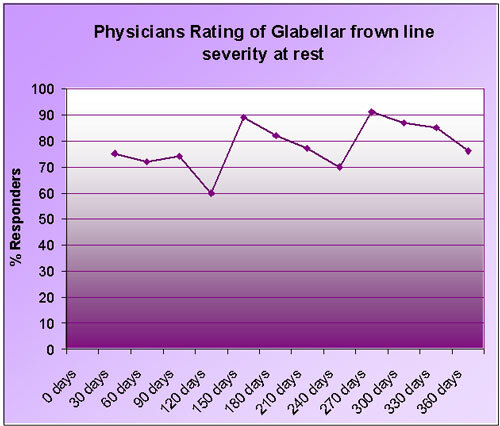 The graph shows that over 70% of the patients showed significant improvement in their glabellar frown lines (i.e. the appearance of their wrinkles when trying not to frown) 30 days after their first injections. This improvement continued after repeat Botox® injections at days 120 and 240. Data taken from Carruthers, Lowe, & Menter; One year study on the safety and efficacy of Botulinum toxin in Patients with Glabellar Lines; Presented at the AAD March 2001. On the basis of this evidence, most practitioners would now recommend an initial course of Botox® treatment every 3 or 4 months for the first year. It now appears that after this, the time between future injections may lengthen, with practitioners reporting that some patients may only need to return twice a year to maintain results. 40 year old patient frowning before first treatment. Patient trying to frown 7 days after the injections. Female raising eyebrows before injections. Raising eyebrows 7 days following the treatment. Photographs courtesy of Dr David Eccleston at MediZen . Click for ALL Botox clinics in the UK & Ireland registered and verified by Consulting Room. 4 out of 5 based on 4 customer reviews. Choosing the correct dose for a particular patient is not as straightforward as your Botox course tutor might have you think.